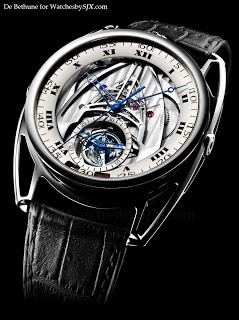 De Bethune recently unveiled the DB28ST dead seconds tourbillon. This is the second DB28 with tourbillon, the first was the beautiful DB28T of SIHH 2011. Like its sibling the new DB28ST has spring-loaded lugs which allow the titanium case to hug the wrist. Unusually the DB28ST has a platinum bezel. This obviously uses a variant of the movement found in the beautiful DB25T with its stunning blued titanium starchart dial, which has been inverted to reveal the tourbillon and dead seconds mechanism on the dial side. Around the open-worked centre is a frosted, sterling silver chapter ring. 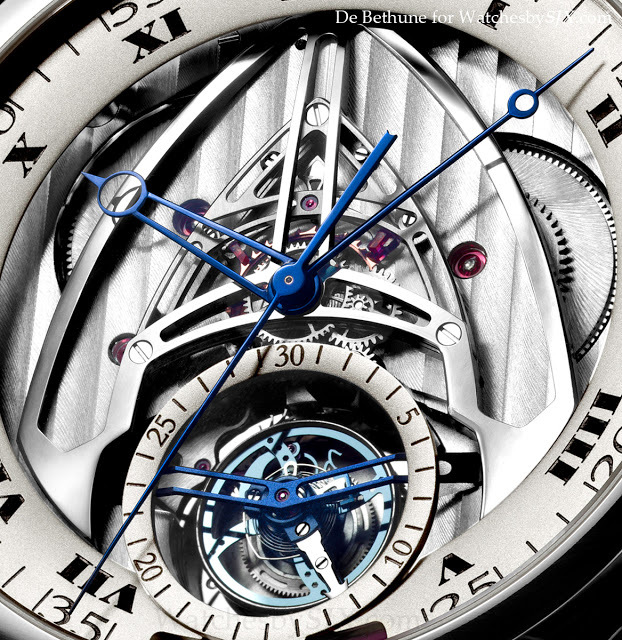 Beautiful horology blending old and new, as is usual from De Bethune.